What a beautiful post Carol. I like the way you've used 'silk' in your haiku. Nicely composed. You create beautifully. Thank you for sharing. your blog is inspiration, soft and delicate. I am so honored you liked my Haiku. I will be visiting often. Great post with lots of eye candy! 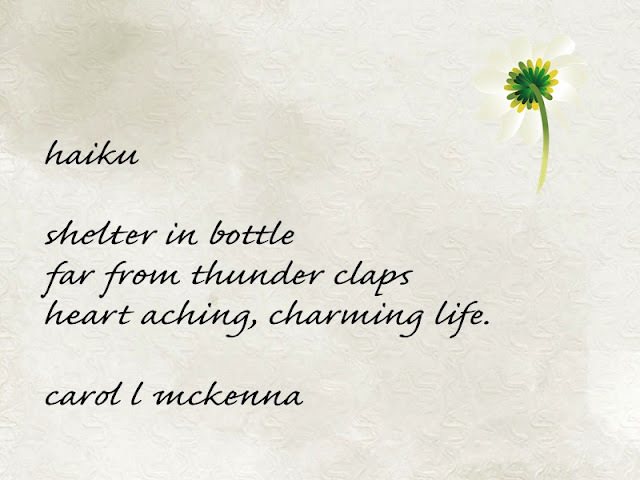 Love your Haiku too! nice abstract interpretation today Carol! I am so impressed how creative you are and how many people you make happy. Thank you so much for it. What a sweet portrait, Carol! Love your Yin and Yang work. Nice job. Great photos and Haiku's. Soft and charming. I always enjoy reading your beautifully composed haikus and the equally beautiful photos. Love your yin yang exercise-I'm going to check out that book you mentioned.Thanks.Happy PPF! Beautiful, beautiful work! You've inspired me to make some changes on my own blog. Thank you!! Carol, you live in a beautiful place! 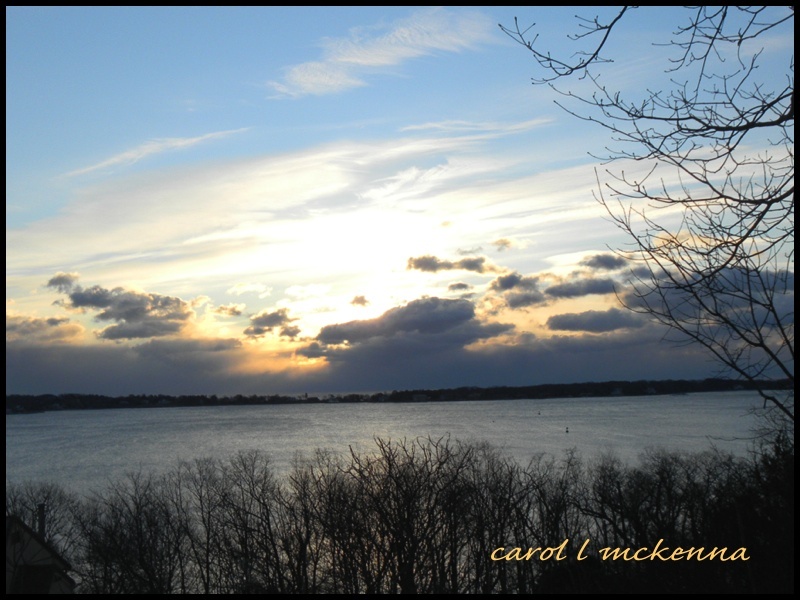 I always enjoy seeing your photos of the areas around Cape Ann. Lovely art and haiku. Warm reflections in that picture (and I clicked right at this moment because you're next door to me over at James's reflection meme) ...but I'm so glad to read and see the rest of your post too. Loved the drawing and always your joyful haikus. Great haiku. Yes, heart always belongs at home, I find. Hello Carol, thank you so for these Friday offerings. Your first piece reminded me of doing scribbles and then finding the images in the lines... 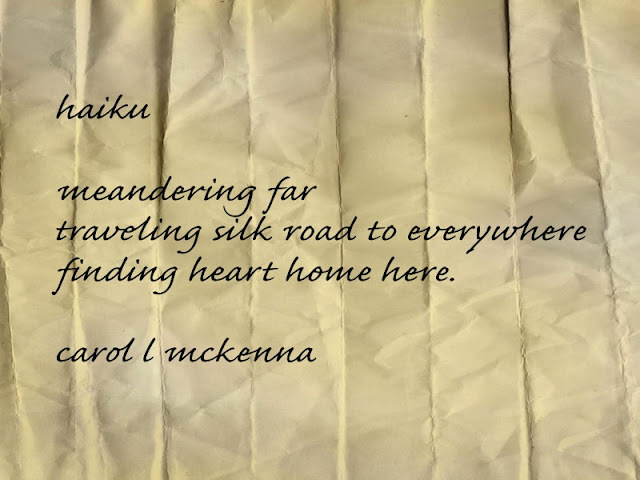 I love both your haiku, but the first so resonated deep in me... "traveling silk road to everywhere finding home here"... lovely! Have a beautiful weekend! I love, love your Ying and Yang, so beautifully painted and your haiku is so poetic. I LOVE your expressive drawing/painting- so FULL of JOY, it makes me smile. And your silk road haiku was wonderful too. Wonderful, magical lighting on the deck in that last photo! Travelling a silk road, even in my imagination, is an exotic adventure! forgot to mention, your dog looks like my dog...so sweet!!! Lovely as always. A frosty tour of your beautiful village. Thank you For sharing your haiku and your heart's delights! What an awesome Harbor , and puppy. I always wished that I could 'haiku' - maybe one day I will take the time to learn. Ying and Yang look so happy exercising on the beach. HPPF ! I like your post and your photos but I love your dog, what a cute dog. A bottle really is a kind of shelter, isn't it ? It contains, surrounds, keeps together -- maybe that's why mariners build ships in bottles, a sort of contained bit of ocean roughness, carved out by glass walls. It sounds like a great book, Carol (I've added it to my "read" list). cool, and I do mean cool, photos..Yeah, I bet traveling the silk road was quite a long adventure. heart aching, charming life. . . . do i love these words. Nice photos, and I love that drawing! I wish I had some artistic ability, but that's just not something I have. I love the haiku's and your drawing is so sweet. Enjoy the snow! That is a great shot with just the right texture...one lonely boat. And I like your other color shots as well. Thanks for stopping by! Oh I love your drawing. I will have to look up the book by Steven Aimone. A agree with Alicia...the first haiku looks really great on that folded paper. As always you work is just wonderful. I especially enjoyed your poetry this week. A greeting from cold Norway. Blessed are those who find their heart's true home! Love your creativity, Carol! Beautiful images and haiku! Have a happy weekend! Nice reflection in the snow. Have heard about the cold wave up north, and I always wonder how y'all stay warm! That sounds like a very interesting book! love your drawing! Gosto do barco...meu tema para o the weekend in black and white também foi esse. Lindas imagens, beijos! I love your Haikus because they always make me ponder...which is a beautiful thing! I like the haiku, illustration and photographs very much. Lovely poems...yes, warm and sunny in California where I am! HPPF! Hi Carol, only just found a comment you made on my blog from a couple of weeks ago on my CC post, and I wanted to stop by and thank you for your visit. I thoroughly enjoyed my visit here, wonderful post! Have a great weekend! 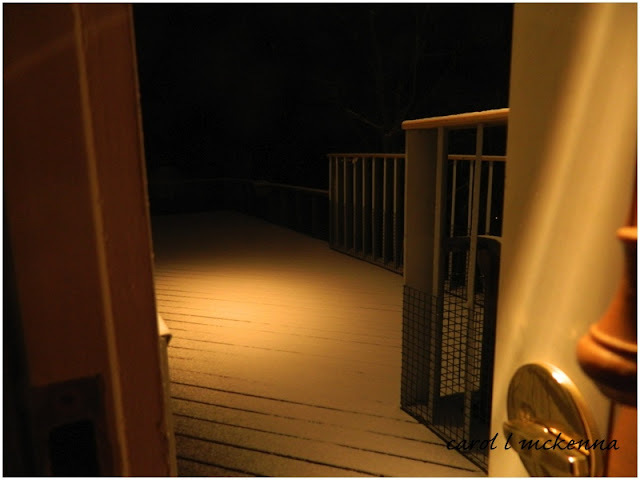 We got a bit of snow last night, it was light and fluffy! 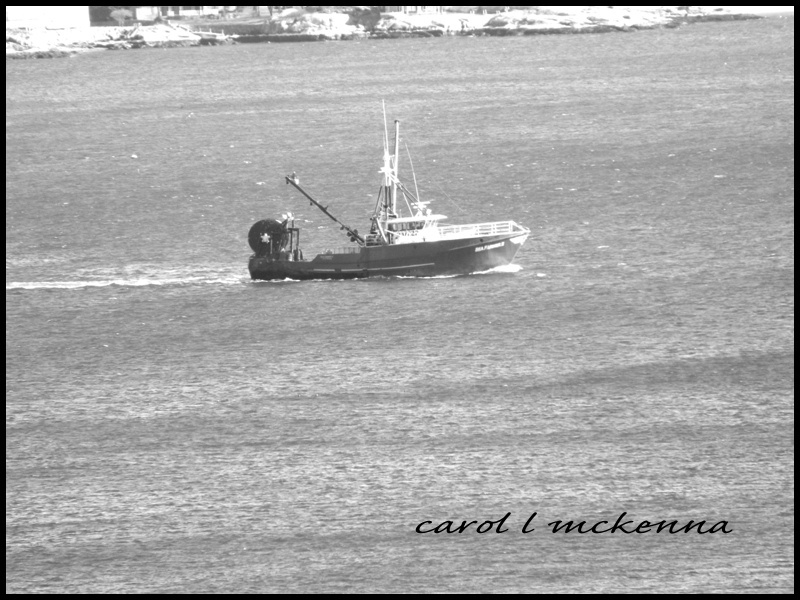 I like the monochrome tugboat. Fishing is a cold, hard job! nice composition. Oooo, that Steven Aimone book sounds like one I would benefit from. Will check it out - Thanks for sharing! Love your photography in this post! Beautiful images. Visiting late for OYGIF. Hope you'd find time to visit my entry.